Last week, on the 6th of January, Friday, SAA held its appreciation night for its athletes, coaches, officials, supporters and all stakeholders of local athletics. It was an event that is a celebration of triumph, to honour the excellent performances that were achieved in 2011. 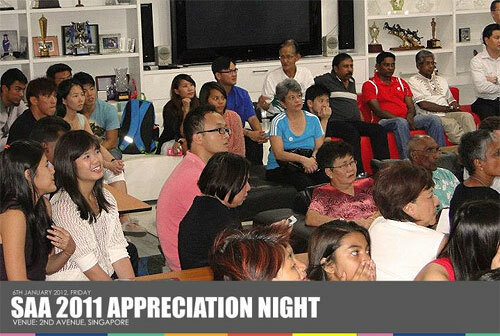 SAA President Mr. Tang Weng Fei and his wife opened their home to some 120 guest. The event was also an early open house to celebrate the upcoming Chinese New Year. SAA President Mr. Tang Weng Fei welcomes his guest to his house. He covered matters on the achievements and results achieved last year by our officials, coaches and athletes. Mr. Tang also touched on SAA future plans. SAA Vice-President of Training & Selection Mr. C. Kunalan shed light on the various monetary incentives the association has awarded to athletes and coaches. He also highlight the qualifying details and criteria for the upcoming 2012 major meets. Click here to view the photos from the event. View the award recipients.